The Cooks: Easter and Owen turns 2! Well it turns out that we need to upload the videos from Owen's birthday, so we shall skip right to Easter. 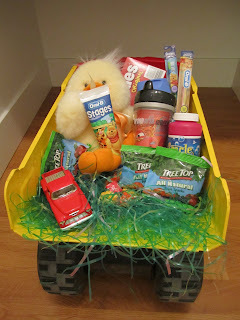 The Easter bunny decided to bring Owen some treats via truck, not a basket. That red car now must go to bed with him and I have to tuck it in, or he doesn't go to sleep. Here is Owen dancing at Grandma Gin's house after spilling green smoothie all down his shirt.